DISCOVER THE ADVENTURE - JOIN THE FUN OF SCOUTING! Hiking, camping, swimming - Boy Scouts do it all! 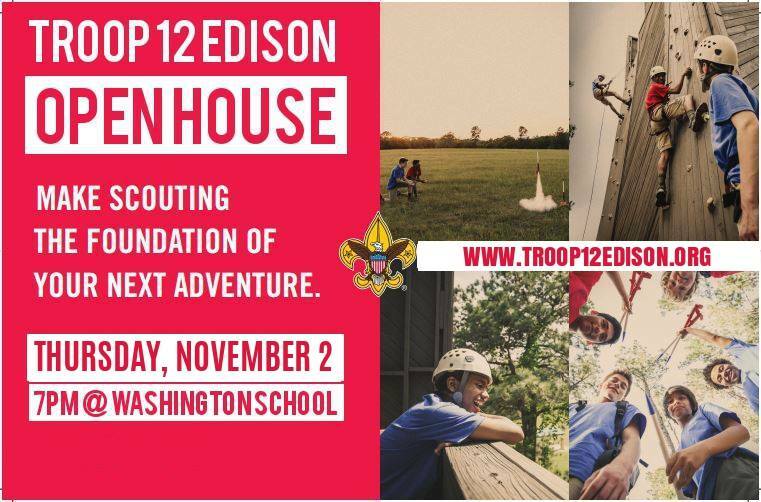 Stop by Troop 12's Open House - Thursday 11/2, 7pm - 8:30pm @ Washington School Gym (153 Winthrop Rd, Edison) - to learn more about what we do! Boy Scouts is a year-round fun program with a purpose. Scouts typically meet once a week for activities, to learn new skills, and to plan outings.They will be a member of a small patrol and the larger troop. As Boy Scouts advance through the program, they are recognized for their achievements. 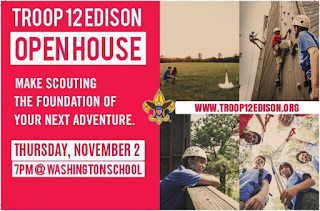 The troop is led by the boys and adult leaders supervise the activities, ceremonies and trips. Boy Scouts includes boys who are 11–18 years old (5th grade - 12th grade). Scouts build physical fitness, character, and good citizenship—all while having a great time with family and friends. Most importantly, Scouting encourages them to do their best—a lesson that will help them achieve success throughout their lives.